Jean shopping for most of us a nightmare. Even if you have the most stunning figure there is nothing worse than trying to find a pair of jeans, the style, the shape and the fit you want. And of course there are so many styles and shapes of jeans to choose from which makes it even harder. This season apparently there is a trend for some pretty zany jeans in stripes florals and bright colours – but whether you are a fashionista or more of a traditionalist when it comes to jean shopping the following jean buying tips are worth taking on board. Decide what shoes you want to wear your jeans with – and take the shoes with you when you go shopping. Remember the back pocket placement on jeans can make them more or less flattering. Pockets set wide apart can add width, whilst pockets set close can create the illusion of a compact bum. Pockets that tilt outwards can create curves. 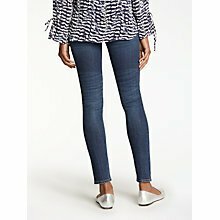 A bootcut hem can balance out big hips and thighs and can give the look of really long legs with killer heels. If you have a petite or boyish shape straight leg jeans will give you a more defined outline. Mid to to highrise (measurement from waist to crotch), are usually the most flattering cuts for skinny jeans. And talking of high rise and low rise – your body shape will very much determine which you can wear and will suit your shape more. 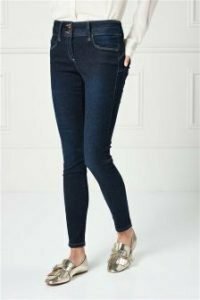 If you haven’t got time to troop round the shops looking for jeans then Next or John Lewis are really good options to buy on-line from. There both offer a glorious range of styles whether you are after a skinny jean, straight-leg or boot-leg jeans. Both offer excellent sizing guides and advice on how choose the best style for your body shape. Check out the following links below for further information. Before you order make sure you get the tape measure out and follow their guidelines to help you choose the correct size. This may be something most of us would like to avoid but will save time – and is a useful exercise whether you are shopping on-line or visiting the shop in person.If you are not sure of your size try ordering the items in a couple of sizes but do make sure you return the items which you don’t want to keep immediately. Next offer an excellent standard delivery service which is free or you can pay for a premium service which will deliver evenings and weekends. And of course you can also choose to click and collect from store. Like most things in life – a bit preparation and planning will save you time and money. It will also help you make sure that the next pair of jeans you will wear until they are worn out and don’t sit forlornly in the cupboard gathering dust.